Initially titled A Review of the Affairs of France and published from 1704 to 1713, this periodical was edited and largely written by Defoe. The Review became a popular source of political and social news, eventually being published three times a week. 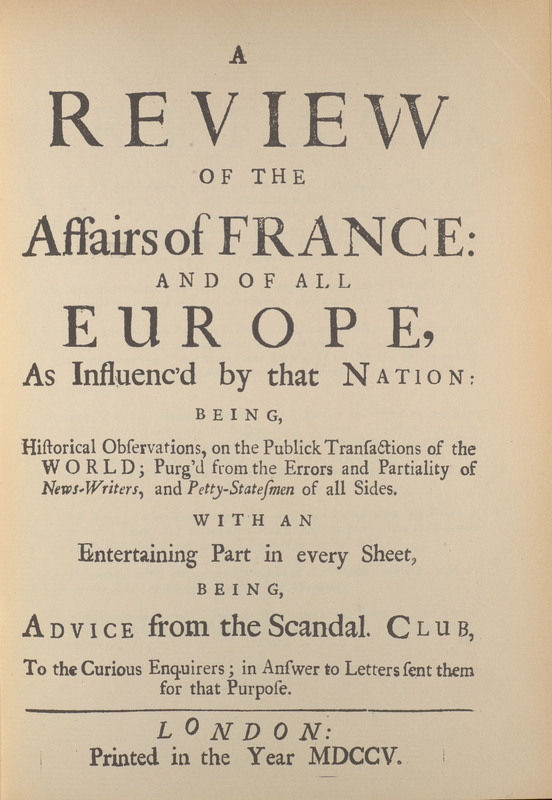 Not limited to information about France as the title would imply, Defoe used this publication to espouse his often controversial opinions on matters of politics and economics. While Defoe also published a seemingly limitless number of political pamphlets during the time The Review was in print, his idea of providing common people with a timely and accurate account of English society is reminiscent of modern journalism. After The Review ceased publication, Defoe would go on to write for or edit as many as twelve other newspapers. Defoe's Review. New York: Published for the Facsimile Text Society by Columbia University Press, 1938. A version of this text has been digitized and is available through HathiTrust.